The David four door wardrobe is made of engineered wood and more specifically MDF. The dimensions of the wardrobe is fairly large and spacious. The wardrobe has a width of 1575 mm, a depth of 610 mm and a height of about 2130 mm. The wardrobe has four doors, six drawers and two shelves. The wardrobe weighs close to 173 kilograms and is well built. The furniture also has a melamine finish to protect it from any scratches. The wardrobe has hanging shelves that are made specially for Indian clothes. 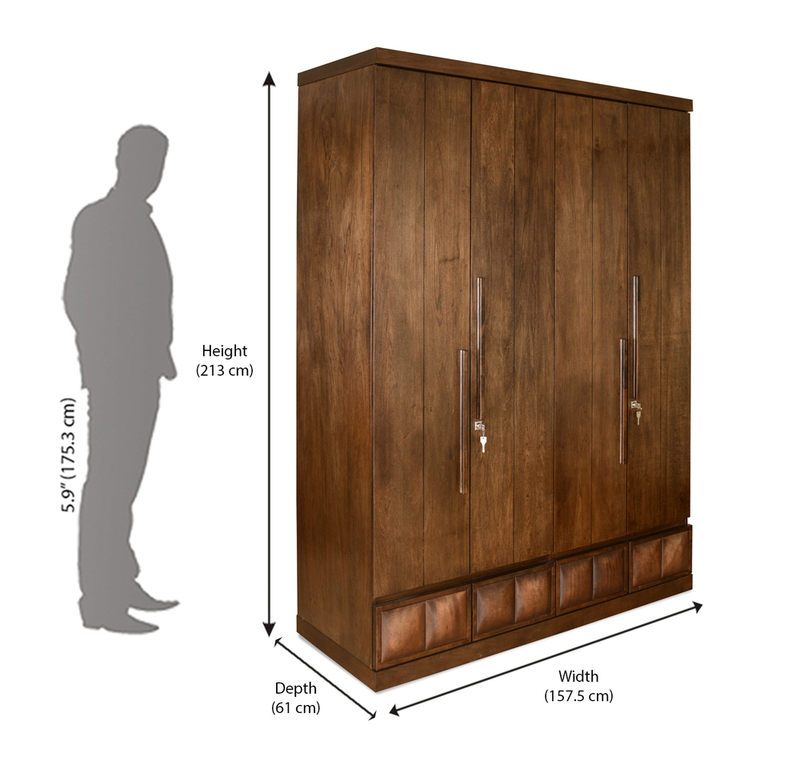 The David four door wardrobe will be a great addition to your home and it is spacious enough to store all your clothes and accessories with ease. It has an enormous storage space and it looks aesthetically pleasing. The Dark Walnut colour bring out the beauty of the wardrobe. The MDF material used for its construction is durable and stronger than other types of particle boards. The wardrobe looks simple and elegant. The drawers are placed inside the wardrobe and has locks so that you can store your valuables inside them. This adds another layer of security. You can buy it today from @home.